Which means I’m fueling the final push to hit our fundraising goal of $25,000 for The Wes Wehmiller Scholarship at Berklee College Of Music. Right now we’re sitting at about $20K. That’s great, but we’ve got a bit to go to hit the magic number. It’s going to be a ridiculous show. All of the details are here, including how to buy tickets. And if you can’t come, and just want to donate to help the cause, you can do that here by selecting “Additional Non-Ticket Donation”. My final plea for donations and ticket sales can be read here, in the latest BellerBytes. Please check it out, and if you’re moved and inspired to buy a ticket or donate to the cause, angels will flock to your doorstep tomorrow morning and whistle your favorite song. OK, maybe not, but you never know. This is one of those times where I just look at my life and go, huh? Me? Uh, OK. Really, I’m not kidding about that. Because when I spell out what I’m about to spell out, it’s hard to put into words just how grateful I am for it all. * The Aristocrats will tour the U.S. this summer (July/August) in support of the new album. I’ll list the tour dates for both at the end of this missive, but first I wanted to at least get my thoughts down for the record on all of this. And I hope you’ll forgive me for not including a bunch of links in this blast – it just takes more time and I want to get this up as soon as possible. First, the Satriani thing came as a total surprise. His camp reached out to me on the last day of the Aristocrats second album sessions, a week-long 14-hours-a-day affair, so the surreality of it was magnified by my exhaustion. There were some difficult scheduling issues to work out, and they were gracious enough to make it all work somehow. Then, once we firmed it all up – and not until then – I found out that Marco Minnemann was going to be the drummer! Add in Mike Keneally on keys, and for those in the know, it’s Joe Satriani with the KMB lineup as his backing band. Hard to believe, but there you go. Needless to say, I am extremely honored and grateful to Joe Satriani for thinking of me for this tour, and I really, really look forward to rocking stages across Europe and the U.K. on his Unstoppable Momentum tour. Man, it’s going to be fun. The Satriani news is amazing for both Marco and I (and let’s not forget about Guthrie Govan touring with Steven Wilson this spring and summer as well! ), but believe you me, that does NOT mean The Aristocrats are slowing down any. To the contrary, it’s made us more determined to get our second album done and get on the road to promote it with a U.S. Summer Tour. We’re working furiously on mixing and tweaking the record to make it sound all nice and special, plus artwork, bonus content, etc. The way the scheduling worked out, which was a minor miracle, it looks like this: The Satriani UK/Europe tour runs from May 15 to July 14. Then, The Aristocrats U.S. Tour starts immediately afterwards, running from July 17 to August 28. Looking at all that, we’re shooting to release The Aristocrats’ second album – probably called Culture Clash – on July 16.
and then this, with the caveat that this tour is still in the process of being booked…but I thought it was worth it anyway to share with you what we know right now. Needless to say, some of this could change! I really don’t know what else to say about all this, other than, apparently it is my destiny to play with really good guitarists. That’s more than fine with me. Finally, I know this is WesFest week, and there’s the Mike Keneally UK/Europe tour coming right up. I don’t want anyone to forget about that, and I’ll get back to that next week. But seeing as how the news about Satriani was tearing across the interwebs, I thought I should weigh in officially. And now I have. I drove 1200 miles in the past two days, so I’m too whipped to write more. Go here for a more complete update in the meantime. I’ll be back with more soon. This is the time of year where I usually start to panic that nobody’s going to come to WesFest, so I really ramp up the promo-whoring into FULL URBAN POST-NUCLEAR ASSAULT MODE. 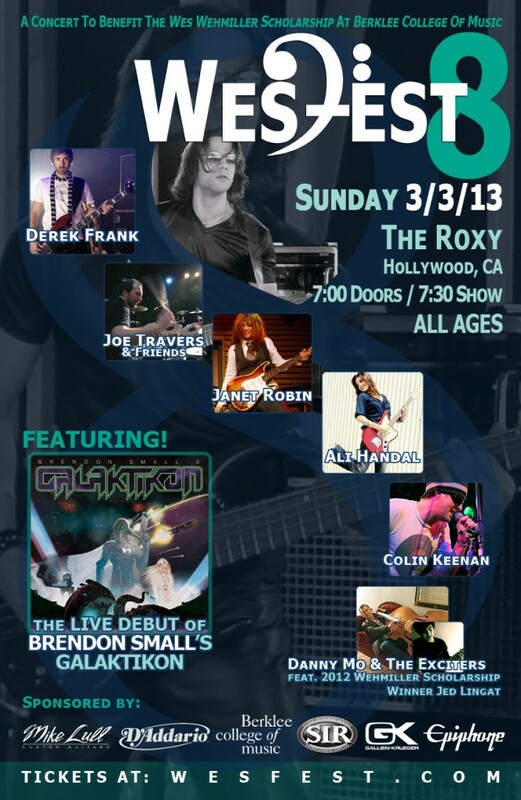 As you surely know, WesFest 8 will be on Sunday, March 3 at The Roxy in Los Angeles, and the headliner is the live debut of Brendon Small’s GALAKTIKON. You know, Brendon Small, the guy who created Dethklok and Metalocalypse and that whole thing. That guy. His solo project. It rules. And the band will be 11 insanely talented people featuring…aw hell, just click here and read more about it. So we shouldn’t need to bribe you to come to support this worthy cause (the Wes Wehmiller Scholarship at Berklee College Of Music) but we’re going to do it anyway. Those who buy tickets and come to the show will be eligible to win an EPIPHONE THUNDERHORSE EXPLORER GUITAR or a GALLIEN-KRUEGER MB 500 SUPER LIGHTWEIGHT BASS AMP! Full details on the giveaway items are right here, at your clickable convenience. So you’re coming, right? And I can stop with the panicking now? That’s good, because I need to get there somehow, and so Kira Small and I have decided to do one of our patented cross-country tours where we do house concerts, small venue shows, and I do some bass clinics along the way. That will run from February 16 to March 12. You know, I said all of this much more eloquently in the latest BellerBytes. That’s why I wrote this blog post in the first place, to point you in that direction. I just forgot. But now I unforgot. See? Now you know what I was working on since the new year. Well, that and a bunch of other things, and we’ll get to that in the coming days. But first, how about the live debut of Brendon Small’s Galaktikon as a killer headliner for the 8th annual WesFest benefit concert? It’s going to be a massive show. The band will be an 11-piece monstrosity with four guitarists, five vocalists, and lots of names you may know. I have a feeling it might sell out. You might want to get tickets now. Want more info than I feel like typing in this lazy blog post? You can check the calendar page for a lot more details, or you can just read the full Wes List e-mail that describes everything in detail. That calendar page has more on it than just WesFest, by the way. Check it out, and pray for me.